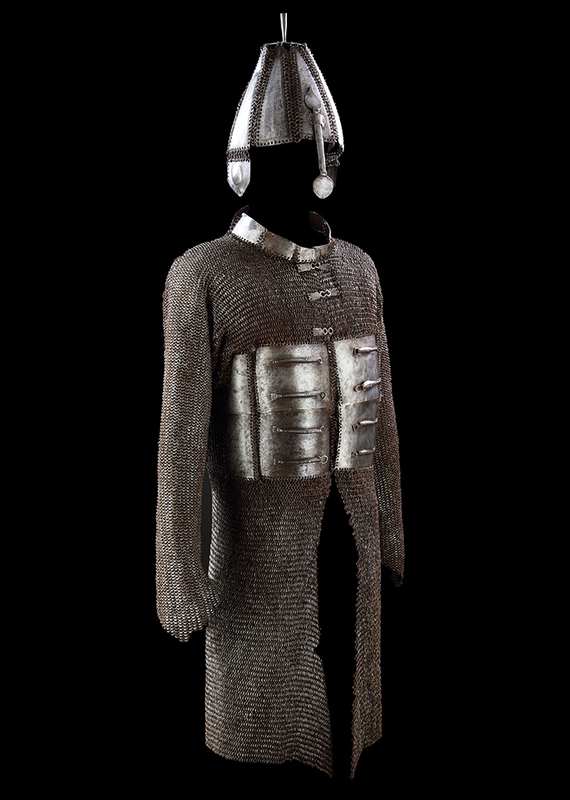 This long, heavy chainmail shirt has a number of interesting features. Firstly, the armoured collar is a rare inclusion as hardly any other examples have such an addition; and, similarly, the top buckles are scarce articles within this context. Also notable are the punch-dot decorations around the plates’ borders—a fitting feature as the Bikaner armourers are known for having marked their weapons with punch-dot numbers. The date of 1691 AD is two years after the Siege of Adoni in 1689 when Maharajah Anup Singh (1669­ to 1698) took the city on behalf of the Mughal Emperor Arungzeb (1658 to 1707) and famously brought back to Bikaner a huge cache of arms and armour. At the rear, five columns of slim plates protect the wearer’s back while allowing free movement, the central column boasting attractive shaping. The shirt is made from alternating rows of theta and riveted links. The unusual inclusion of theta links gives the shirt extra strength at the cost of considerably greater manufacturing time and expense. This fact, along with the additional features described above suggest the armour was made for somebody very important. A shirt of similar form, also with a collar and fish-shaped buckles (although without the theta links), is in the Royal Armouries at Leeds, UK. A few international museums as well as a small group of collectors and dealers, including Eric Vaule purchased the best of the Bikaner Armoury’s inventory when it was de-accessioned in the late 1960s and early 1970s. Complementing this shirt is its rare Indian helmet of turban form. Clearly, its design has been based on the turban helmets of the Ottoman Empire, the shaped ear flaps being indications of that heritage. A similar Indian helmet from the British Museum is illustrated by Robert Elgood in his 2005 book Hindu Arms and Ritual. The top of the helmet and the plume holder are sympathetic modern replacements. The shirt was formerly in the Bikaner Armoury, India, and then the notable collection of Eric Vaule, USA. The helmet was formerly in the Bikaner Armoury, India, then in a private collection in England. R. Elgood, Hindu Arms and Ritual, Chicago University Press, 2005, p.58, fig.5.3.